Years of yo-yo dieting made Leonard borderline obese. See how a trip to Las Vegas altered his goals and inspired him to go from 23 to five percent body fat! It was time for a change when I moved to Michigan and gained 30 pounds in six months. This was a years-long struggle of terrible yo-yo dieting that I couldn't get under control. As a former college basketball player, I remembered how easy it was to play the sport and participate in physical activity without it feeling difficult. I moved back to Michigan after living in the Dallas-Fort Worth area. My nephews, who are now in high school, started to challenge me in my old age. The athlete inside me never left, but my body told a different story. I made a commitment to eat clean and work out for one year. While transforming, I was approached about competing several times in the men's physique bodybuilding division. 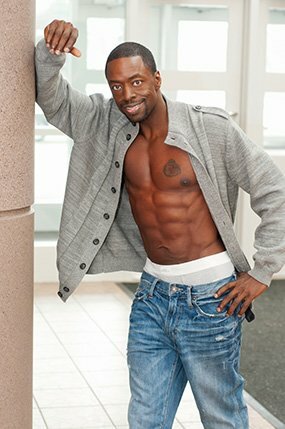 I researched about men's physique and thought it would be nice to compete again. When I was in Las Vegas, Nevada, I saw hundreds of people in excellent shape and knew I had work to do if I wanted to be on their level. But I was surprised to hear people ask if I was in town for a competition. I had no idea what they were talking about. Later I found that they were referring to the Olympia. It was a sign and I added it to my goals in September 2012 along with my original goal: to be a featured transformation on Bodybuilding.com. When I was overweight, I never had energy to play with my daughter and made excuses not to play basketball. My knees were in extreme pain. I couldn't play pickup ball in the driveway without getting winded. Now, after my transformation, I currently play in a basketball league, run around with plenty of energy, and usually guard the best player on the opposing team. I'm enjoying the fountain of youth. A former employee recommended looking online for a trainer and nutritionist. I used one for four months and did tons of research. I worked out six days per week and didn't miss a session no matter what. There were times I went to the gym at 1 a.m., or got up at 3 a.m. before work to train. On business trips, I found gyms to use at hotels. I didn't completely give up alcohol, but I had it in moderation. After the Las Vegas trip where I set a goal to compete, I found an outstanding local nutrition coach who had an online service, bodybuilder Bryan Beaune of Building Your Temple. He helped me realize the steps needed to accomplish my goal, created my nutrition plan, and stayed in constant contact, either in person, or through email and text messaging. I fought through lower back strain, swollen knees, shoulder injuries, and the mental challenge that came with dieting. Looking in the mirror and telling myself to keep going helped me overcome injuries and the mental challenges. I harvested inspiration from YouTube videos by the HipHop Pastor. My favorite line is "When you want to succeed as bad as you want to breathe, then you'll be successful." I listened to it twice each day for about two months before and after my workouts. 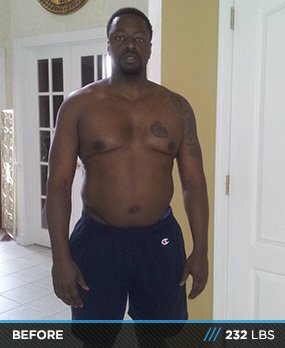 The most challenging part of this lifestyle change was the diet. Positive encouragement from Bryan Beaune helped when I wanted to eat something that slowed the process. The re-feeds were awesome, I must say. I realized my goal and stepped on stage for the first time in Metro Detroit. I placed fifth in the men's tall open division and third in the master's 35 and older division. I will compete in the master's nationals 40 and older division next and hope to place there. I have my sights set on a pro card in the coming years. Adding lean muscle will help me achieve that goal. I will also become a certified personal trainer to help others achieve what they may think is impossible. Don't let the scale determine your success. Use the mirror and your clothes to determine progress. If you have a bad day, start over on the right foot. Want it as bad as you want to breathe. For those who transformed, remember the pain you dealt with to make gains. Drive forward looking straight ahead. We don't need the review mirror to see what's behind us; the old person is in the past. We passed that person by. I looked at Bodybuilding.com daily. It was and still is part of my research. I look at the transformation articles constantly and read everything on the site. I love We 'Mirin and hope to be featured soon. If it wasn't for Bodybuilding.com, I wouldn't be in shape. The site has been an inspiration for me. I love the prices also. Special thanks go to Bryan Beaune. It has truly been a pleasure working with him. Please continue to change people lives. Thank you to Erin Banks of Enhanse Photography for the great after photos. You were there in a pinch for me. We have a great team. Let's get it at nationals. Go Team BYT! Thanks to Erika for the brown rice recipe and for dealing with my grouchiness during dieting.